About 25 per cent of Tocal's convicts left wives and children behind in Britain and Ireland, but the separation was not always permanent. As an incentive for good behaviour, convicts who had served part of their sentence could apply for free passage for their wives and children to join them in New South Wales, and at least four of Tocal's convicts made application. All four were Irish. In 1828 Denis Caroll, a ploughman from County Tipperary convicted of insurrection, received approval for his family to be sent out, but it is not clear if his wife Julia and their four children made the trip. Michael Fea, a linen weaver with a life sentence for 'unlawful oaths', successfully applied as soon as he finished his sentence at Tocal, but his wife refused to emigrate. Another Irish rebel, Thomas Keating, was at Tocal when he received approval for his wife and two sons to come to New South Wales, but there is no indication that they arrived. 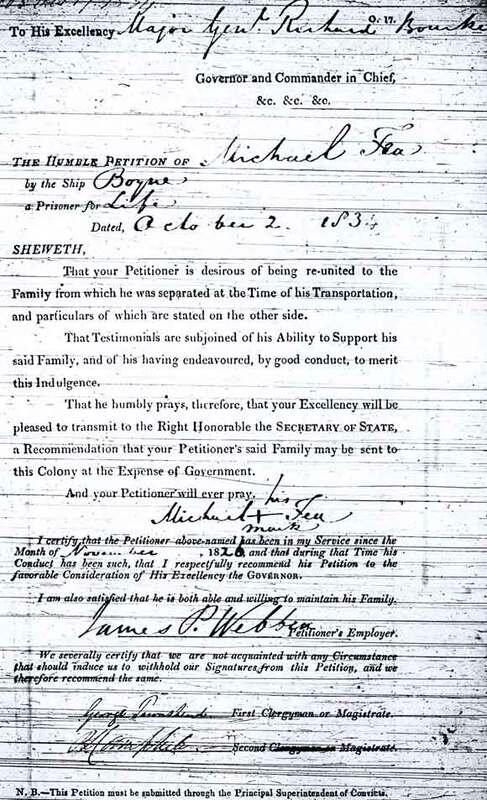 John Shea was assigned to Tocal in 1829 and after his sentence expired he applied for free passage for his wife Johanna and one child. His application was approved and his wife accepted but when they were to embark they apparently had second thoughts and could not be found. About three quarters of male convicts in NSW never married because of the shortage of women. These bachelors, often lonely old men, left little trace in the civil records apart from their deaths, which were usually registered by someone unrelated who knew very little about them. Below: Michael Fea's application to bring his family to NSW, supported by Tocal's owner, James Webber.